Multiple teams are reportedly interested in pairing with the British based outfit including Rahal Lanigan Letterman Racing, but Andretti Autosport seems to be McLaren’s most likely landing spot. This is due in large part to Fernando Alonso’s brief foray in the series a couple years ago with AA, the relationship culminating in a disappointing – though highly lucrative – Indy 500 finish. Prepare yourselves for five AA cars next season – and some more orange in the field. Alo’s impact on the 500 was greatly exaggerated in the media and in reality he’s little chance of winning if he returns. The 2017 Rookie of the Year honors at Indy, or “Great Hardware Robbery,” were a bad joke or worse as we’ve pointed out and may be playing into Alo’s thinking on joining IndyCar. After all, when a 24th place showing somehow earns him widespread acclaim in the U.S., why wouldn’t he want to race here as opposed to languishing in Europe? 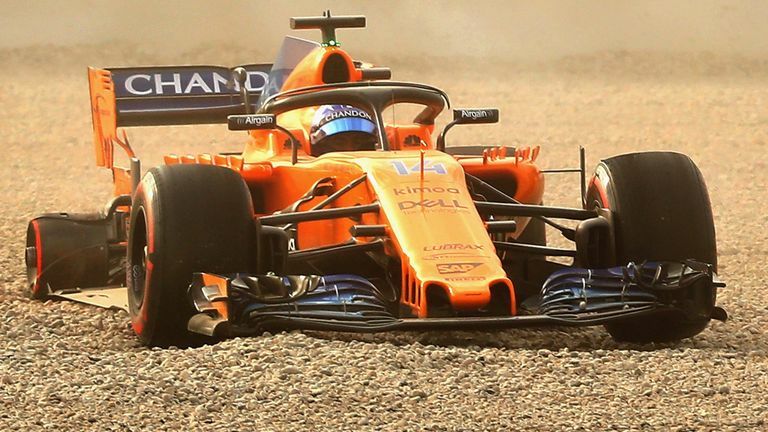 Led by Zak Brown, McLaren currently sits 9th with Alo (and 16th with its other driver) in the points, with no shot whatsoever at a title again this year. In fact it’s been a decade since the team’s last championship, and the terrible results don’t stop there. McLaren’s last Grand Prix win was six years ago. That’s Marco level incompetence. It’s obviously why Alo’s so disillusioned and ready for a change. The absolute last thing the series needs to morph into is a dumping ground for F1 rejects, has-beens and malcontents. Think Rubens Barrichello in 2012. IndyCar’s already adopted a similarly boring schedule to F1’s, chock full of road and street “events” rather than real races on oval tracks. There’s even been talk of f-ing F1 potentially poaching Scott Dixon, which with McLaren in the mix clearly would be no trade at all. Of course, too, there was the team’s spying controversy in 2007 when they were caught stealing info from Ferrari, earning McLaren a $100 million fine and ban. That’s just what IndyCar needs – more Bill Belichick types in the paddock. Meanwhile, IndyCar’s uncontrolled slide toward further European decadence and meddling continues, unabated. So too does the f-ing F1 invasion. This entry was posted in Andretti Autosport, Bill Belichick, Fernando Alonso, Indy 500, IndyCar racing, Marco Andretti, McLaren, Michael Andretti, Rahal Letterman Lanigan Racing, ROY award, Rubens Barrichello, Scott Dixon, Zak Brown and tagged 2018 season, F1, IndyCar, IRR, irreverent humor by IndyRaceReviewer. Bookmark the permalink.